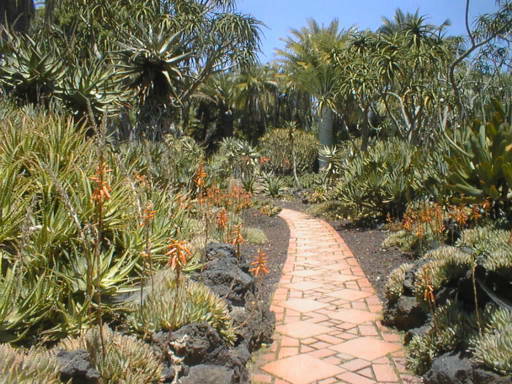 Pathway through the Aloe Garden at Lotusland. The Aloe Garden at Lotusland is a specacular sight in, especially in late winter when many aloe are in full bloom. The brick pathway leads down from the lotus pond through the aloe garden to the famous white clamshell pool. The Aloe Garden is mainly a horticultural display with many very fine specimens but with little collection or source data. Continue the Lotusland Aloe Garden Tour.